The following is a transcript of a recent speech given by Dr. Gerhard Visscher. “Are we still as self-consciously Reformed as we should be? Why do Evangelical churches also attract Reformed believers to visit their services or even to join them? Is the Reformed faith missing something? What sets the Evangelicals apart from the Reformed? Can we learn something from the Evangelicals?” These are the questions I was asked to answer this evening. First of all, I would like to express appreciation for the fact that we can have in our midst Rev. M. Pawelke, the senior pastor of a church just down the road from mine, Brant Bible Church. Your presence here this evening is important on three counts. First of all, because symbolically it shows already that the choice really is not between “evangelical” or “reformed.” The two belong together; it is “both…and” rather than “either…or”, as we will see later. Secondly, your presence is appreciated because also in these discussions honesty is of paramount importance. It is easy to create a caricature of a church or a movement when you have no one from that church or movement present. And we have no desire to do that. The ninth commandment applies when we speak about churches just as much as when we speak about individuals. And thirdly, having received members from our churches, you no doubt have an impression of us through them, and it will be interesting for us to hear something of that. 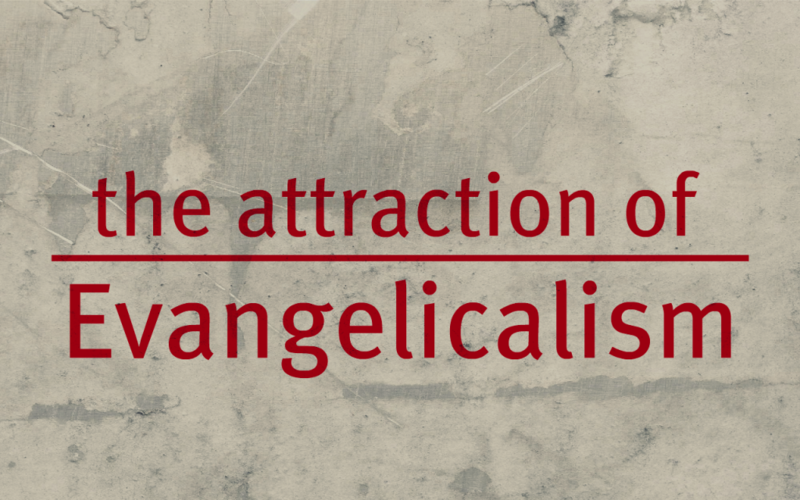 To define “evangelicalism” as the term is used today seems to be a somewhat elusive task. Originally, of course, the significance of the term was much clearer. John Calvin’s Institutes of the Christian Religion begins with a preface in which he pleads with King Francis I of France for the sake of “persecuted evangelicals.” Martin Luther was called “doctor evangelicus.” In those days, Roman Catholics often referred to Protestants as “evangelicals.” The word itself of course comes from the New Testament word for the “gospel,” the evangel. That is why we should also not make it a choice between reformed or evangelical. It is a normative concept; the gospel is what must shape the lives and the thought also of Reformed people, and to be called “evangelical” must remain a high honour. The fact that some have claimed this term as their distinctive trademark does not mean that Reformed people must abandon it. We must and we may be reformed and evangelical. The supreme authority of Scripture as a source of knowledge of God and a guide to Christian living. The majesty of Jesus Christ, both as incarnate God and Lord and as the Savior of sinful humanity. The lordship of the Holy Spirit. The need for personal conversion. The priority of evangelism for both individual Christians and the church as a whole. The importance of the Christian community for spiritual nourishment, fellowship and growth. So what evangelicalism is trying to do then is to sketch the bare minimum, determine the kernel of Christianity. Evangelicals may differ on the relative emphasis they place on the six elements, or on the precise interpretation of those elements, or even on additional elements that they choose to emphasize, but these six elements must be there. It explains why evangelicalism is transdenominational – there are Baptist evangelicals, Anglican evangelicals, Charismatic evangelicals, Presbyterian evangelicals, Roman Catholic, and then, Iwe are told, also Reformed evangelicals. It also explains why there is no pure evangelical church either, for every church will want to add at least some elements which will then make it some other special blend of evangelicalism. There is a real danger that evangelicalism, sensing the need for a distinct identity, will define itself overprecisely, negatively or reactively. In an earlier chapter I pointed out that there is a natural affinity among evangelicals, based on six general beliefs. To add to these would run the risk of alienating or disfranchising a substantial number of evangelicals through an unjustifably attenuated understanding of what evangelicalism actually is. The more rigid the definition of evangelicalism, the greater the number of people who are in fact evangelicals who will be improperly excluded — including Martin Luther, John Calvin and Jonathan Edwards, each of whom could easily be excluded by some of the more experimental definitions of ‘evangelical’ offered by well-meaning yet historically uninformed enthusiasts. In a nutshell then, evangelicalism is rich. Rich because we recognize here, not the work of the devil, nor the work of anti-Christian forces. We recognize here catholic, Christian principles. The work of the Spirit of God is alive in evangelicalism. It is very important for us to acknowledge that. We seldom hear more biting words from the lips of our Lord Jesus than we do in Matthew 12 where there are some who dare to call the work of the Spirit of God the work of Beelzebul (12:22-38)! But whereas evangelicalism, by virtue of these principles, is rich, many even from within the heart of the movement are saying that it needs to be much richer. It needs some reshaping. It needs deepening. And, if I may for a moment be allowed to predict the future a little, it seems that the deepening and the reshaping may actually come in the next decade from within the Reformed roots of Evangelicalism. According to McGrath, evangelicalism finds its background in the Reformation, in Puritanism, and in Pietism. But many of those who are critiquing evangelicalism, McGrath included, see much of the desired depth of insight coming from out of evangelicalism’s own Reformation heritage. While finding it lacking in terms of evangelism, McGrath speaks of “the intellectual rigor of the Reformed tradition.” He quotes from the distinguished German historian Karl Holl who once wrote that “one must be clear that a good deal of the penetrating power of Calvinism depends upon its intellectualism. Calvinists know what they believe, and why they believe it.” McGrath tells us about the new interest in the writings of the Old Princeton school, about conferences on Reformed theology and that he himself leans in that direction. He says at one point: “The most important strategy for the conservation and nourishment of evangelical identity is to rediscover the roots of the movement, especially in the New Testament and the sixteenth century Reformation.” And McGrath is not alone here. Many have been trying to direct the movement in a Reformed direction. There is the work of a group called Christians United for Reformation (CURE), with Michael Horton as its leader. There is the work of Ligonier Ministries, with R.C. Sproul as its key figure. There are the writings of a man like James Packer. He has said at one point, referring to the weaknesses and the danger of the fragmentation of evangelicalism: “The only thing that can unite us is a bigger, broader, wider and more generally agreed upon theology. And I find that theology only in the Reformation heritage.” Mark Noll too, in the Scandal of the Evangelical Mind, wherein he laments the fact that evangelicals have not sufficiently worked out the implications of the lordship of Jesus Christ over all aspects of life (politics, science, etc. ), speaks very appreciatively of the contribution made so far by those in the Dutch Reformed tradition, although it must be said that he himself is not nearly as focused about going in this direction. So then, even though I acknowledge my own personal bias, from the work of mainline evangelicals themselves, it seems that twenty years from now evangelicalism will not be where it is today, and that the reshaping may just have had a reforming character about it. It shares much with the Reformed tradition already, but as it searches the Scripture and its Reformation roots, it may just come much closer to us. What changes would I like to see? In order for the theology to deepen, a choice is going to have to be made regarding the points of difference between the Arminian and the Reformed. There needs to be a stronger recognition that Jesus is not only our Saviour but also Lord over all the aspects of our lives, as Noll has pointed out. One of the striking features of much of evangelicalism is its general disregard for the institutional church. Except at the congregational level, the organized church plays a relatively minor role in the movement. Even the local congregation, while extremely important for fellowship purposes, is often regarded as a convenience to the individual. Ultimately, individuals are sovereign and can join or leave churches as they please. Often they seem as likely to choose a church because it is “friendly” as to do so because of its particular teachings. Denominational loyalties, although still significant for substantial numbers of evangelicals, are incidental for many others, especially those with a transdenominational consciousness who have attempted to bring unity to the movement. Needless to say, such a view of the church must have an effect on the life of the body, both on the way in which members of the community function as on the stability of future generations. This problem is no doubt presently somewhat inherent to evangelicalism. Once you so clearly define what is essential and what is not in a minimalist way, the people will behave like that as well. They will come and go as the situations change. Much richer and much more stable, in our estimation, is the approach of a Reformed church which says: Jesus Christ is gathering His church, and in the question of whether I may leave or where I must go, I need to be obedient to the Head of the church and the norms laid out in His Word (cf. Articles 27-29 of the Belgic Confession). Tied in with this sixth controlling conviction is no doubt also the doctrine of the covenant and the position of children. One needs to ask: just who belong to this community to which evangelicalism is committed? Are children also part of it? Are they being called to conversion because they are covenant children, or in order that they might become covenant children? As Prof. J. Kamphuis puts it, evangelicalism knows of personal decision, but it does not know of the covenant wherein the person coram Deo is called to decision. Tied in with that, in my estimation the prevailing evangelical notion that the Scriptures are unclear on infant baptism is untrue, and this is a disturbing impoverishment of the Christian faith. To mention one argument, this would mean that all the “households” mentioned in the book of Acts to which baptism was administered — no fewer than five households — were childless, if not servantless, households. What a strange coincidence in a society where children were plentiful and the family was an extended one! Do we really believe that Peter and Paul were telling their Jewish audiences that now that they were in the New Covenant era, their children were not included in the covenant in the same way — that they had to, as it were, leave their children behind? Would the opponents of the gospel not have made quite some hay out of that? Should it not be apparent that if all who believe even in this age are “children of Abraham” (Romans 4:11,12; 2:28-9; Galatians 3:14, 29) to whom the promise goes out (Gal. 3:29; Acts 2:39), that this promise applies also to their children? Much changes when we come into the new covenant, but there is also much that remains the same. The covenant is with the believers and their seed; children of believer’s can know that they are heirs of God’s promises; in this troubled age, in every age, they need to be assured of that in their baptism. There is a richness here that evangelicalism overlooks to the detriment of their children. But since our audience this evening is predominantly Reformed, it is necessary draw lessons from all of this for us. All of this makes our main concern this evening so much the more urgent: if it is true that the Reformed view is richer than that of evangelicalism, then why would Reformed people be attracted to evangelicalism today? The answer to that question is probably no less difficult to determine. Let me mention, though, that in order to do so, I have done a number of things besides reading literature that I have shared so far. First of all, visits were made to some brothers and sisters who left the Canadian Reformed Churches and joined churches that were more evangelical in outlook. And secondly, in order to get somewhat of a wider picture, I made use of an interesting new phenomenon of our age; it has been called the Refnet. By means of computers and Internet, the Refnet brings together about a hundred Reformed people from across the country and in some cases around the world, and allows them to share opinions, concerns, and so forth in an open and easy manner. Most of them are students who are used to asking some questions and searching for answers. When they were the very questions that we are busy with tonight, no fewer than about 40 responses were received in a matter of a few days. Obviously, these questions live among us. The Refnet has been helpful to ensure that the perspective I share tonight is not just something seen from my own limited viewpoint. What is then the answer? Why would people opt out of a Reformed church for a more evangelical church? No doubt, there are often specific reasons. Sometimes, social and family reasons have a lot to do with it. But, of course, it is neither appropriate nor necessary to get into those. We need to stand back and look at the wider picture, and necessarily, make some generalizations. And when we do that, then it appears that whereas the Reformed position is richer than the evangelical, the great problem with too many Canadian Reformed is that we do not sufficiently appreciate how rich we are. Evangelicalism may be rich, Reformed may be richer, but the Reformed too often do not realize just how rich we are. In the words of our Lord, we have lost “our first love”(Rev.2:4). Our enthusiasm is often waning. We are not very good at welcoming new converts into our church or our communities; when they come we are more surprised than delighted. We are not often very open about our faith. Our faith may be deep, but we do not really “wear it” very well. And it happens not only among teenagers, but even among adults, that if someone speaks from out of the heart about their personal struggles or experiences or the like, then too often we put them down and dismiss that as insignificant or inappropriate. The Globe and Mail last week reported about a poll which found that Canadian people are, as they put it, “blessed and stressed.” Well, maybe that speaks even more about Reformed people: even more blessed, but hardly less stressed. It is a generalization and it may be jarring, but I believe it is true: too many Canadian Reformed people are bored and burdened with their faith. It drags them down rather than lifts them up. I am certain that evangelical churches are not perfect either, but the point is: when people who are sensitive to all of this, walk into an evangelical church and maybe feel a better welcome and a greater warmth, it is understandable that they are drawn by that. I think it is too bad, and shortsighted, and wrong to leave a church for such reasons. It is very regrettable, because they are exchanging something that is far richer for something that is less rich. But I can understand it. Where does it come from? Perhaps it is true that we have intellectualized and objectivized too much of the gospel message. Maybe the preaching has too often been too abstract and intellectual. Maybe the emphasis has too often been on believing a set number of doctrines, and too little on growing in likeness to the Son of God who loved us and gave Himself for us. We are tremendously rich. And much of what many evangelicals need can be found within our Three Forms of Unity. There simply is no confession of an evangelical or fundamentalist church that is richer than the Three Forms of Unity. But we need new appreciation for what we have. In a delightful book, called Klank en Weerklank, Dr. C. Trimp wrote a final chapter about evangelicalism. The chapter and the book ends with these words, which I translate: “Take the truth from out of an erroneous position, and you will deprive it of its power.” He says: “Characteristic marks of the evangelicals are often the counterpart to typical shortcomings of the church.” When the Reformed church looks into the mirror of evangelicalism, it comes to see some of its own blemishes. Dr. Trimp singles out shortcomings with respect to the joy of faith, to missionary zeal, social concern, the development of a Christian lifestyle, and warmth in preaching and worship. Let me then also refer to some such shortcomings. You will understand that much of this has to do with emphasizing certain aspects rather than abandoning some positions and adopting some others. Maybe we do not need a major overhaul, but we need some fine tuning and everyone who drives a car knows that fine tuning can make quite a difference. I believe that the Reformed church needs to emphasize to a greater degree what McGrath has called his fourth controlling conviction, namely, the need for personal conversion. Even though our confessions are sufficiently clear on this, I do not think our people are. When I ask catechism students whether they need to be “born again,” alarming answers are often the result. Mark Noll says at one point: “the Dutch Reformed are not strongly conversionist (they expect, rather, baptized children to grow gradually into maturity as Christians).” Certainly the lack of clarity among us on this point has disastrous consequences for the Christian life. Without regeneration, our works can only be works of the flesh and our churches become nothing more than social clubs. Details of time or place or experience of conversion are not what is significant; for most covenant children, this is certainly more gradual; but what is significant is an increased awareness of the need to live in constant dependence on Jesus Christ as our living Lord and Saviour and growing in our spiritual lives as His Spirit works in us. While it is true that evangelicals need a stronger sense of the covenant and the position of children therein, as suggested earlier, it is also true that the Reformed church must beware that with all its emphasis on community and covenant, it does not lose sight of the individual within that community. Probably the greatest lesson of the gospels is that no one is saved simply by being a member of the community. Salvation comes through Jesus Christ alone. Nicodemus too was a covenant child to whom our Lord said very emphatically: “Truly, truly, I say to you, unless one is born of water and the Spirit, he cannot enter the kingdom of God”(Jn 3:3). Secondly, we need a new appreciation for the value of openness among us. If the Gospel calls us not just to think rightly but also to live and to love rightly in this troubled age, we will need to share with each other much more of our life with God as we go through our successes and our failures. If we are called to live in the joy and gladness of faith, we will need to encourage each other to do so. We are not finished with the preaching or with our Bible studies when all we have done is discover what the text means; we must move on and explore what it means to you and to me. As we move closer to God, we must be willing to move closer to each other in this respect. Openness and sharing is part of fellowship, is it not? The language of faith must be used not just when we talk about sermons, or have our annual homevisit; it must be integrated with all of life. Of course, at the same time, we have to realize that not everyone is alike emotionally. Just because some do not express the joy of faith very easily, does not necessarily mean that the joy or the faith is not present. We are not all the same. On the other hand, while we allow for that, we also need to realize that one of the reasons fallen man does not want to give outward expression to his faith is because part of his fallen condition is a tendency to keep the distance between himself and God, to keep God at least at arm’s length, whereas to integrate our faith with our day to day living brings Him very close to us. Fallen man does not want that, but regenerate man rejoices in it. An appropriate result of faith is profession of that faith, is it not? As Rev. Van Dooren used to say often, “when the heart is full, it overflows at the lips.” A new emphasis among us on this point will necessarily lead also to greater warmth. Reflection on these two points may also be the key to another concern that Dr. Trimp mentions: the need to develop a Christian lifestyle. What better way to encourage our young people and each other than by emphasizing conversion, dependence upon Christ and His Spirit, in an open spirit of Christian compassion and love? Another byproduct of greater openness will no doubt be greater effectiveness in evangelism. I firmly believe that one of the greatest challenges that lie also before the Canadian Reformed community is the matter of getting the message out to our communities and our nation. Now that our churches and schools and other organizations are in place, we have no excuses left. It is incumbent upon a faithful church to be diligent here too and to go more than just go through some motions. And with a greater emphasis on the work of the Holy Spirit in conversion and communion, and a greater degree of openness with each other, this will be a delightful byproduct. Here we can learn much from the Orthodox Presbyterians and from the Reformed Presbyterians; here we can learn from the evangelicals as well. For, as McGrath has pointed out, a major conviction of the evangelicals is the priority of evangelism for both individual Christians and the church as a whole. And there are also Reformed evangelicals from whom we can learn a great deal. A fourth concern that I have, also after studying all of this, is that there is something healthy in understanding that there is a limit to the human documents to which we are bound by virtue of membership in a church. Evangelicalism as a movement has made this quite clear, whether there be six principles or ten. Think of the comment made above: “the great sin of evangelicalism is to be narrow.” As Reformed communities, however, we need to remember this. What I mean is this: when you and I become members of a Canadian Reformed Church, we are not bound to adhere to each other’s opinions; we are not bound either to what we perceive to be the consensus of opinion in the churches; we are not even bound to each other’s interpretations of the confessions. The only human documents we are bound to are the ecumenical creeds and the Three Forms of Unity. That is why they are called The Three Forms of Unity. Here the degree of unity among us stipulated. These are the controlling convictions of a Reformed Church. That is quite a few more than the six of evangelicalism, but it is not too much for what are they but a delightful and precious summary of the wondrous truth of God’s holy Word, to which we are bound from Genesis 1 to Revelation 22? To be sure, we need to continue to discuss with each other whether our lives are in conformity with that complete Word of God and even that confession. But you see, when and if we go beyond that and try, consciously or less consciously, to bind each other to our own opinions, positions, or practices, then the wide-openness of evangelicalism becomes attractive simply because then there is a narrowness associated with being Reformed which is very unattractive, inappropriate and contrary to our own foundations. Then we have made a mistake often made in the history of the church and run the risk of repelling true believers who really do belong among us for they believe the same doctrines and want to live on the same basis. Then it is not really that evangelicalism has become attractive, but it is that our special blend of what it is to be reformed is rightly found to be really quite unattractive. Then reformation is overdue for a binding is being imposed that God Himself does not impose. Of course, we need to consider all these concerns not because otherwise some of our members might leave. We need to consider them because it is the Word of God that calls us to be such. When you read the Word, you do not read of a Paul or of a Peter who are shy about their faith anymore; rather, consciously dependent on Christ and His Spirit, they are open and vibrant with their enthusiasm and joy on account of what the Father has done in Christ. The Church is being strengthened when all his children are growing “into him who is the head, into Christ, from whom the whole body…makes bodily growth and upbuilds itself in love” (Eph.4:16). To conclude then, I make this appeal to those who are reformed but find evangelicalism appealing. Do not leave. Do not abandon ship. Your task and your calling is to stay where God has placed you and, together with so many others, make your contribution to the life of the church so that she lives openly and vibrantly to the praise of the great God of all grace. For evangelicalism may be rich, but to be reformed is even richer. And every generation must remind the reformed church to continue the process of reformation and renewal, to the glory and praise of our most gracious God. Ronald H. Nash, Evangelicals in America: Who they Are, What they Believe (Nashville: Abingdon, 1987), 16-21. Translated from “Gereformeerd en evangelisch” in the insert to De Reformatie Vol. 66, No. 14. (January 5, 1991), 2. Institutes of the Christian Religion Edited by John T. McNeill. (Westminster, 1960), I, 11. J. Kamphuis, “Evangelisch of Gereformeerd? I”, De Reformatie Vol. 57, No. 6. (November 7, 1981), 82. Compare also, by the same author, “’Evangelical’ or ‘Reformed’?” in Lux Mundi, 1:2 (1982), 4. Alister McGrath suggests that the term “evangelical” as it is now predominantly used dates from 1942 and the formation of the National Association of Evangelicals in the United States. It was chosen in order to distinguish themselves from the fundamentalists and the pejorative associations of that term. Evangelicalism & the Future of Christianity (InterVarsity Press, 1995), 22. Arthur Carl Piepkorn has expressed the same in Profiles in Belief: the Religious Bodies of the United States and Canada Vol. IV. (San Francisco: Harper & Row, 1979), 3-15. On this point, see also George M. Marsden, Reforming Fundamentalism: Fuller Seminary and the New Evangelicalism (Grand Rapids: Eerdmans, 1987). I wish to thank Margaret Vander Velde, the associate librarian of the Theological College of the Canadian Reformed Churches in Hamilton, Ontario, for drawing my attention to the publication of this book. Ibid., 55-6. Others have defined the distinctives somewhat differently. David Bebbington refers to four “special marks” of evangelical religion: biblicism (a reliance on the Bible as ultimate religious authority), conversionism (a stress on the New Birth), activism (an energetic, individualistic approach to religious duties and social involvement), and crucicentrism (a focus on Christ’s redeeming work as the heart of essential Christianity), Evangelicalism in Modern Britain: A History from the 1730s to the 1980s (London: Unwin Hyman, 1989), 2-17. Compare the introduction to Evangelicalism: Comparative Studies of Popular Protestantism in North America, the British Isles, and Beyond, 1700 – 1990 Edited by Mark A. Noll, David W. Bebbington, and George A. Rawlyk (New York: Oxford University Press, 1994), 6. In “Seeking the Evangelical Essentials,” Faith Today:Canada’s Evangelical News/Feature Magazine, (May/June 1995), Krysia P. Lear maintains that Ian Rennie, dean of Ontario Theological Seminary, adheres to this definition. Lear also mentions Gordon Smith of the Canadian Bible College and Theological Seminary in Regina who affirms four essentials: (1) faithfulness to the ancient creeds with particular reference to the uniqueness of Christ; (2) a strong emphasis on experiencing the new life through the ministry of the Holy Spirit; (3) commitment to missions and evangelism, and (4) commitment to fellowship with God’s people (page 20). No Place for Truth or Whatever happened to Evangelical Theology (Grand Rapids: Eerdmans, 1993), 129. Also referred to by McGrath, Op.cit., 109. (Grand Rapids: William B. Eerdmans, 1994). (Wheaton, Illinois: Crossway Books, 1994). Some significant articles are also found in M.S. Horton, ed., Power Religion: The Selling out of the Evangelical Church (Chicago: Moody Press, 1992). For more on this, the reader is referred to my article, “Toronto Blessing or Temples of the Holy Spirit?” Clarion Vol. 44, No. 11. (June 2, 1995), 253-256. Op.cit., 97. The remark was made in “Johannes Calvin,” Gesammelte Aufsätze zur Kirchengeschichte III: Der Westen (Tübingen: Siebeck, 1928, 267. Mark A. Noll, in The Scandal of the Evangelical Mind, also speaks appreciatively about the contribution of John Calvin in this regard (Op.cit., 37-38) but in the end he sees the future more in a willingness for evangelicalism to learn from all kinds of traditions (Anabaptist, Eastern Orthodox, Lutheran, Reformed, Roman Catholic), p. 249-50. Horton has also been quite critical of evangelicalism in his book, Made in America: the Shaping of Modern American Evangelicalism (Grand Rapids: Baker, 1991. Interview published in Modern Reformation, July/August 1993, p.21. Quoted by McGrath, Op.cit., on p.116. Op.cit., 216, 224, 237. He speaks very appreciatively about John Calvin’s efforts to encourage Christian thinking (37-38). It is of interest that in that regard both Calvin College and Redeemer College receive honorable mention (p.17). He also comments later: “The Dutch Reformed tradition has been the single strongest intellectual resource for the renewal of Christian philosophy”(237). In the end Noll sees the future more in a willingness for evangelicalism to learn from all kinds of traditions (Anabaptist, Eastern Orthodox, Lutheran, Reformed, Roman Catholic), Op.cit., (249-50). Understanding Fundamentalism and Evangelicalism (Grand Rapids: Eerdmans, 1991), 81. Compare here C. Trimp’s comments in “Gereformeerd en evangelisch,” De Reformatie Vol. 66, No. 14, p. 7. Michael Horton also speaks about the problem of individualism in evangelicalism in Made in America, 95f., 166-173. “Evangelisch of Gereformeerd? II”, De Reformatie Vol. 57, No. 7. November 14, 1981, p. 97. See also C. Trimp, “Gereformeerd en evangelisch,” De Reformatie Vol. 66, No. 14, p. 6-7. Acts 11:14; 16:15, 33; 18:8; 1 Cor.1:16. Cf. Robert Rayburn, What about Baptism? (Grand Rapids: Baker, 1979), 75-80. For more on this, see James Dykstra, “The Reformed world goes Online,” Clarion, Vol. 44, No. 19 (September 22, 1995), 432-433. Murray Campbell, “Jobs, not Quebec, nation’s top worry: Survey finds Canada blessed, stressed,” Globe and Mail Toronto, November 13, 1995, p.A1. “Ontneem aan de dwaling haar waarheid en gij ontneemt haar haar kracht.” Klank en Weerklank: Door Prediking tot Geloofservaring (Barneveld: De Vuurbaak, 1989), 177. “Karakteristieke kenmerken van de evangelischen zijn vaak de tegenhanger van typerende gebreken van de kerk.” Ibid., 176. Heidelberg Catechism, L.D. 3, L.D. 33; cf L.D. 16, 17; Canons of Dort, III/IV, arts. 11, 12, 13; Belgic Confession, Art. 23. Compare the first full paragraph of the Form for the Baptism of Infants, “First, we and our children are conceived and born in sin and are therefore by nature children of wrath, so that we cannot enter the children of God unless we are born again…” Book of Praise, 1993, 584. In Encouragement: the Key to Caring (Grand Rapids: Zondervan, 1984), Larry Crabb and Dan Allender make some significant comments about this. They point out that total openness in which everyone is ripping off their masks and baring themselves is not appropriate either. “Total openness replaces surface community with fractured community and eventually no community,” (41). The right solution is instead to be committed to sharing that which is edifying (Eph.4:29); we need “to become committed, not to sharing ourselves, but to sharing the Lord by ministering to those needs”(49). W.G. de Vries makes this point well in “De Evangelische Beweging III,” De Reformatie Vol. 69, No. 24, (March 19, 1994), 477-8. As an example, consider the excellent book by J. I. Packer, Evangelism and the Sovereignty of God (IVP, 1971). Previous What Does it Mean to be Reformed?